A foamy, dark beer with a heavy top; with a richness of smells, reminding those of bourbon barrels and complex malts pulling rather to the sweet and caramel notes. The alcohol content is impossible to feel; it does not mask the flavors but instead serves as a vessel to more complicated flavors picked up during the barrel aging. The hops cannot be tasted, but definitely, do contribute to the flavor complexity and balance. The taste is out of this world as well - the notes of the bourbon barrel come through and the complexity of malts come through and marry the hops to provide a zesty, complex experience. Heavy, creamy with a strong head, this beer's texture just keeps on giving. Overall, this is a truly exceptional, world-class beer I could but recommend to sample if you ever have the opportunity. 2016 vintage from the state monopoly Alko in Finland. Looks murky orange, actually not a colour to indicate the actual taste/style, merely out of being conditioned to brownish/reddish hue for this type of taste. Only a thin incomplete layer of bubbles rises to the surface, but it does stick. So far not a lot to build expectations on. The nose blows one away and takes you immediately to associations with best of oud bruin. Tart, vinegary, some red fruit, oak when newly opened, but fading as the beer breathes, and replaced by increased acetic acid notes. Very little aroma of alocohol for the strength. Brewery says barrels of both spirits and wine were used but cannot detect any such indicators. Taste is complex, again oud bruin is what I am forced to think of -- the 'bière de garde' classification as style by the state monopoly is just one more proof of lack of competence from the state, as it here only means it is beer to keep. Complex, with just enough underlying sweetness to counterbalance the tartness and the vinegar. Long, pleasant aftertaste with fruit in the middle all around the palate, acidic aromas giving just the right amount of edge, and fading to a smooth finish. Leaves one wanting to take another sip. Extremely easy to drink for the strengh. Vinegar notes are also in perfect proportion, and never go too far. Feel is one of easy drinkability, suitably mild carbonation without being flat. Overall a classic beer. Perfectly balanced and making you want another. Would be really interesting to do a vertical of these, as this was still only two years old. 12/2/18 (Chicago): 1 pint 9.4 oz bottle brewed in 2013, multiple pours into Chimay chalice. Light ruby brown, pour, slight tan head quickly dissipates. 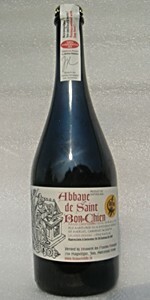 Very sweet wine aroma, grapes, raisin aroma, also note tart aroma. Sweet and tangy taste, wine, fruit, raisins. Nice blend. Light texture, pucker up tartness, very nice. Overall excellent offering! Had on tap at Lures Bar & Grille. Aroma and flavor are incredibly complex with white wine, leather, oak, funk, dark fruit, tannins, and sour vinegar all coming into play. 11% abv is well-hidden. Saved this as a bonus on a tasting session of on tap beers. Smells like sour peaches. Very strait forward. First taste gives a very fruity sourness. Like biting a pomegranate or a pomelo infused in alcohol. The aftertaste gives a silky smooth citrus feel in the back of my mouth. Alcohol evaporates. 750 ml bottle into a goblet. 2015 blend 6. Had 12/30/17. Pours a rosy amber color, a little cloudy, with not much of a head and a little filmy lacing. Smells sour. Aromas of cherries, wine, oak, plums, grapes, dates, figs, light spices, some vanilla. Smells great. The taste leads with grapes, then wine, oak, malt, some cherries and figs, light vanilla and tobacco. A little sour, with a sweet note midway. Smooth, dry, a solid fuller body for the style, well carbonated. Wow, it was hard to just sip this one. So well balanced and complex. Incredible grapes and wood, and structured in a totally different way from any other Biere de Garde I’ve had before. It’s a little pricey, but worth every penny. Run to get this one, when you can. Beautifully cask aged. Love to let it warm up to 50 degrees when I am patient enough. Have enough every vintage since 2006. A great beer to cellar but honestly peaks round 5 years.